The shape of the new Central Hall at York University is of particular interest in that it differs completely from the traditional contours of university buildings, both past and present. 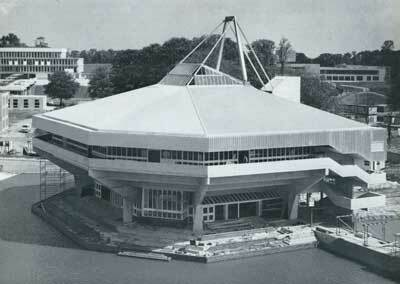 The building encloses an auditorium seating 1,300 with a large stage and is sited on a brick-faced podium surrounded on three sides by an artificial lake. It has three floors of ancillary accommodation with the main foyer at ground level below the auditorium. The roof and upper vertical parts of the superstructure are clad in aluminium. The design of the steel-framed roof, which is suspended from an ‘A’ frame, is also interesting and unusual. The design evolved from the wish to provide a visually acceptable structure which would avoid the need for a suspended ceiling and yet provide an acoustically satisfactory space. The intention was that the roof would provide a strong visual statement externally. The plan of the auditorium consists basically of a rectangle with the two corners splayed at 45°, raked seating being arranged around the stage through 180° in a manner similar to the classical Greek theatre. Two columns 60 ft high and 28 ft apart pass through the building framing the stage opening. These are topped by a 30-ft high ‘A’ frame fabricated from mild steel plate and standing externally above the roof line. The ‘A’ frame is anchored back by two circular hollow sections (CHS) to the lift tower which acts as a counterweight on the axis of the building, thus providing a tied cantilever from which the auditorium roof is hung. 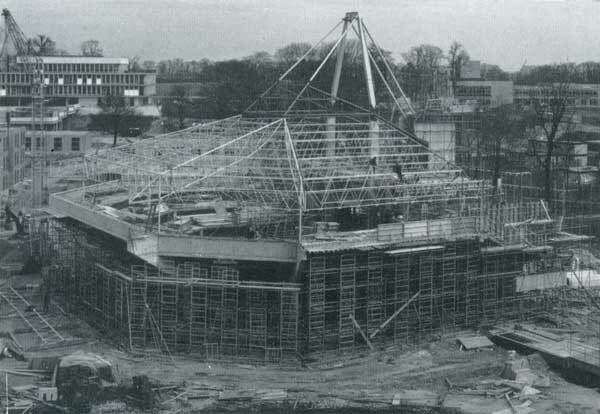 The two CHS front ties each pick up two raking main trusses placed, on plan, on the bisectors of the auditorium splays forming the hips of the roof and spanning on to tubular columns placed at the perimeter of the auditorium. In a similar manner main trusses span from the feet of the ‘A’ frame legs to the perimeter of the auditorium, on-line with the stage wing walls. Secondary trusses at 6 ft 9 in centres span between the main trusses, reflecting the pattern of the seating below. Channel-reinforced woodwool spans directly onto the secondary trusses, the channel being bolted to tees on the top booms to provide lateral restraint. A glazed lantern is incorporated between the two front ties and their respective compression tubes, the depth being used to span the rectangle formed by the feet of the ‘A’ frame and the intersection points of the main trusses. Horizontal wind bracing is provided across the lantern opening and between the secondary perimeter trusses, and vertical bracing to the pin jointed perimeter stanchions. The main trusses are cantilevered beyond the perimeter stanchions to form a canopy to the external access balcony. Access to the roof structure and the projection box is by a continuous walkway around the auditorium perimeter. The lower booms of secondary trusses carry stage lighting equipment: the main auditorium lighting consists of tungsten fittings fixed direct to the soffit above the roof structure. All structural members of the auditorium roof are constructed from CHS. Secondary truss-to-main-truss connections were made by site welding via a split cup and main connections were bolted through flange plates. 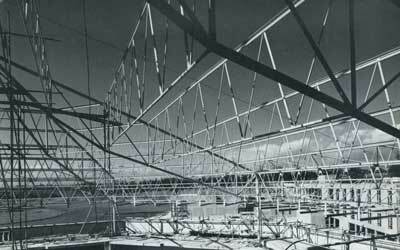 The ‘A’ frame was erected in one piece, the back ties and respective compression tubes anchored to the lift shaft and the lantern structure front ties and main trusses then erected in sequence. Steelwork erection was completed in six weeks. Roof cladding consists of snaprib aluminium on felt, insulation board, a vapour barrier and 2-in thick woodwool. Architects and structural engineers – Robert Mathew, Johnson-Marshall and Partners.